Volcano tours are definitely different from the other outdoor tours. Even, this tour is a little bit different to a common hiking tour to some mountains. Outdoor travelers who love to do soft hiking experience can enjoy the Bromo Ijen Crater Tour Package better. Volcano tours do not usually require a hard hiking effort. Besides, people with a little experience or even no experience at all can do the tour comfortably. This is so because the main point of a volcano tour is not to reach the summit. The main idea of a volcano tour is to get pleasure in the challenge of being in a volcano with the breathtaking view. The priceless feeling and experiences are offered through various tour volcano tour packages. One of the best places for a volcano tour is Java, Indonesia. Travelers can take Yogyakarta to Bromo tour for a total satisfaction. Here are the reasons. Most travelers love to visit Yogyakarta for the ancient temples tours and the people. The people of Yogyakarta are amazing. They can talk about philosophy and catch modernity in an elegant way. Besides, they can preserve their culture though they are very open-minded. Yogyakarta is also amazing with the remains of its majestic kingdom, dances, traditional music, and artworks. Visiting Yogyakarta is also fantastic as we step on some of the villages. Candirejo is one of the stunning villages to visit when tourists are taking Yogyakarta tour. They can stay in the villager’s home and feel the traditional life right from the people. It will be touching and unforgettable to take a walk in the rice fields after getting pleasure with the magnificent Borobudur Temple. After that, lava tour will make such experience flawless. If possible, tourists need to try going through Yogyakarta to Bromo Tour for a perfect outdoor tour in Bali and Java. Bromo Ijen Crater Tour Package is one of the pioneers in the volcano tour in Indonesia. Bromo tour package offers volcano scenery and the magnificent ambiance to attract tourists. There are many outdoor activities and tours that are offered around Mt. Bromo. Most travelers will get wonderful impressions once they can catch the sunrise. However, in some seasons, sunrise is impossible due to a bad weather. Therefore, the peak season for Bromo Tour is around July-August. The weather is good with less rain during those months. And with no rain and clear weather, a sunrise tour will be worth it. Mt Bromo sunrise tour is affordable but leaves wonderful memories for all. Bromo Tour Packages are varied. People can take the shortest tour of midnight tour at an affordable rate. The artistic Yogyakarta city tour can give a special memory for every heart. 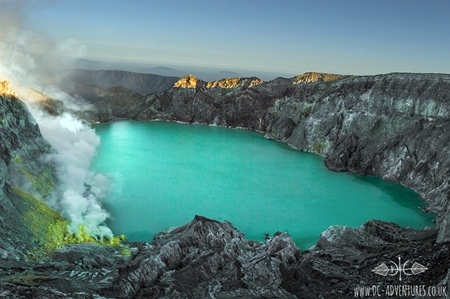 The package will be more outstanding as people take the extended Bromo Ijen Crater Tour Package. Some people love the sunrise at the volcanoes. But people with a deep sense of adventure will know that it is more than that. When the giant crater produces smokes, there are some sounds that are a little haunting but remarkable. The sounds make the atmosphere more sacred and so much thrilling. However, it is recommended that travelers always wear masks when entering the site. Masks can help reduce the effects of the extreme temperature. Additionally, the mask will be helpful to protect our lungs from the sulfur smokes. Travelers can go to sea of sand around Bromo by hopping 4WD. This is a super fun journey since there are a few bumping that tourists might experience. People need to be very careful with the bumps. But the roads are fun actually. Besides, Teletubbies hills are ready to serve the magnificent view around Mt. Bromo. People can try horse riding while enjoying the pleasant air temperature. During the day, the temperature will not be that extreme. In Midnight, it can be freezing though. Those who have visited Bromo several times or feel that this volcano’s midnight tour is enough, Bromo Ijen Crater Tour Package is definitely a fantastic tour to take. Enjoying Bromo for one night will be enough as tourists are with a professional tour guide and services. Bromo Ijen tour package is so recommended for a longer and more special trip. Package in Ijen 3 days 1 night will give tourists the best experience with volcano tour in Java. To make the journey flawless, travelers need to book a package from a trusted Bromoijen tour and travel. Of so many companies running the same services, Java Travelline is one of the most credible ones. Contact the site and enjoy your volcano tour in Java, Indonesia.